I think the above comment, left here on The Tattler last Saturday, is pretty much going to be the City Hall spin tonight. As far as spin goes it is pretty good, but then spin should never be automatically confused with the truth. One is an attempt to convince people of something that might not be in their best interest. The other is, well, the truth. The agenda item in question is on tonight's Consent Calendar. Something that ordinarily indicates the Mayor, who sets the agenda, wants this to be an automatic approval by the City Council. It is considered to be a request for an official sign off on business that has already been decided. No further debate, explanations or conversation is necessary, though the public will likely be asked to comment. If you are concerned about any of this, you really ought to be there to comment. The meeting starts at 6:30pm, and this will come up at the very beginning of tonight's deliberations. 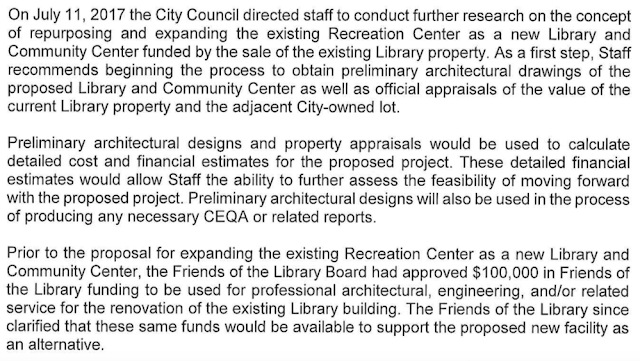 If the project to sell off the Library property and move the contents of the current building to the YAC had already been approved and by community consensus was going forward, then yes, what is described above would be necessary. However, that decision not been made yet. In the previous City Council meeting the residents of Sierra Madre were promised a community discussion before anything was to be done. Rather than that discussion, however, we now have a Consent Calendar item that not only makes a quite large $100,000 commitment to the process (so-called), it also effectively begins the project. With no community discussion or consensus whatsoever. Despite the City Council's rather hastily made promise at the last meeting to allow for just that. When you attended Friends of the Library events and happily donated to their efforts, did you for one minute ever believe that your money would be spent on something that will likely lead to selling off the property the Library has stood on for decades? And even tearing down the building itself, all in order to make way for building a condominium project? No matter how much wine you had been drinking? Hey at least the wine and food was pretty good. Announce a Recall for all sitting Sierra Madre city council members and file an injunction in court to stop this insanity. Save the library. Things move fast in the village. Fast, quiet, and deliberate. Who does that benefit? It benefits the developer$. Got land? In Sierra Madre it is always about the money. The folks in charge just don't talk about that much. So I donated to Friends of the Library to save the Library, so naturally the money is being used to help build the case to tear the Library down. Hey, it's Sierra Madre! The library cost too much and cannot be saved. Move it or lose it. No, it's ok. Measure UUT saved it. I know. I saved the postcards! It can be saved and it will cost more to move it! You remind me of the children's story HENNY PENNY. THE Library is falling, the Library is falling, let's go ask the king (Stockley? Doyle? Buchanan?) and he will tell us what to do. The City is always creating a crisis, then the so called crisis can be solved with their solution. Somehow the solution involves more tax dollars....MINE! actually understands what they're discussing on the net. Why don't you bring him a bright shiny Apple? Good one 8:44, I only wish I had thought of it ! Thank you 7:49. Look the people on this comment board act too curmudgeonly... This is why SM is the way it is. This board acts as a echo chamber, and when a viewer wishes to innocently thank the mod immediately the grouches attack. Yes anonymous boards don't help, but why continue to comment daily if you don't want to have a dialogue with your neighbors. There is a discussion going on about the Library, but instead of Council Chambers it is taking place on a blog. Go figure. Yep, and that's why I am grateful to John Crawford. Grateful to the Mod, me too! There is a Kefalas Solution to all of this, you know. First we build the new building behind the YAC, and then we make the plans. Should save some money that way. The plans that were made for the replacement library during the Downtown Specific Plan days, drawn up by the Pasadena architects PBWS - they are of no use at all? You can thank the people who gave us Calpers for losing our library. The truth is, is that poster July 22, 2017 is correct. Not sure what meeting the Mod was hearing. The truth is, yes thank you for information on this site; but this site is representing your understanding of what is discussed in council. There is truth and there is misrepresentation, being that it is innocent of understanding of accumulation of facts and borne from emotions. I doubt anyone is saying any of those things should not be done, 8:35. But before they are done there has to be that public meeting the City Council promised. By all appearances the city is just going ahead and doing it with no feedback whatsoever from those affected by it the most, the people who live here. Why do I get the feeling that this post came from a former mayor? OK you should also receive a bright shiny Apple. Thank you 8:51. I'd like the MacBook Pro, 15 inch in silver please🍎. In order to save money we should sell city hall and the police and fire department property and move all facilities to the Pool park. What about the empty space at Howie's? In order to save money we should drastically reduce the number of people who work at city hall. True. Then move the remaining staff to a smaller facility and sell off city hall. Can someone please explain to me why this is happening?? WHAT is wrong with the library?? I've been going there since I was a child, my own children go there, it's a perfectly lovely, modest, functioning library with plenty of parking....what is the problem??? It sits on property developers want. I just did a google search and found that many local libraries have the same lingo. Monrovia and Glendale Libraries have Community Centers and Cultural Centers. Glendale Library has an Art Center and a Remembrance Center too. What's that all about? Cultural Center? Remembrance Center? Say What? Thank you. I agree with all the comments above. 10:53 that's interesting. Why can't libraries just be libraries? Especially in such a small town as Sierra Madre. The Hastings branch library is a good example of a small, non-flashy library that serves it's purpose. So when you donated your money to the Friends of the Library, did you do it contingent that the Library never change, move or improve?? Good questions. Can we first have a meaningful public discussion before spending all of that donated money? 8:49 - can you explain what the big rush is? 9:03, Big rush? Seems as though someone has a deadline, doesn't it? Land deal with freshness dating perhaps? The Seniors that raise money for the Senior Center should have input as to how it will be spent, instead the Senior Committee members pull the strings. Same with the Friends of the Library. City Council meetings are public meetings, therefore the public has been informed. Community input will be addressed, the Library has been searching for solutions well over twenty years. The City Council promised a public meeting on the fate of the Library. Instead they are cramming this through. What is the rush? Oh, you know what the rush is. If the city goes holding meetings and opening this up to public discussion people will ask such annoying questions, and honestly, who wants to hear that? You just leave us alone and everything will be just fine. Go shopping or something. 7:52 More like a Salisian solution. Build it without permits, don't adhere to any codes and say sorry later. No problem. "Preserve Sierra Madre has received many emails of concern over the last few weeks once it came to light that the City Council is considering moving the Library and selling off the property to a developer for a likely demolition. The City Council will be discussing this issue at tonight's City Council meeting beginning at 6:30 pm. For those proponents of preservation, we always have to ask ourselves the question: "What's worth preserving?" We also know that losing the character of a town does not happen all at once. It happens one project at a time and then one day you wake up and say, What happened to our town? Once that day is reached, its too late. There's no going back. This is why Preserve Sierra Madre takes each of these issues very seriously and hopes our City Council will do so as well. Most recently, the Henry A. Darling House was lost and now our long-time Library may be sold off to a developer and demolished. Where does it stop? For those concerned about the fate of the Library, you may want to send an email to your City Council Members and/or show up to tonight's meeting. It is important that they get your input before the decision is finalized. This email will also be sent to the City Council members for you to copy and paste as needed. If this City Council was in agreement to change Kersting Court, and refuses to designate the triangular square as historical, as City Council's before them; then what preservation can the Library expect? The rush might have something to do with the city's finances. The city is broke. CalPERS and water bond debt is through the roof. Because of that the Library is no longer financially sustainable and must bunk up at the YAC. The problem is the city does not want to go to deeply into its financial crisis. Yet that is the real reason why the Library must become a roommate. The city sold the UUT as a library issue, but it was always about the local cops getting theirs. The library has always been a throw away in a city of rampant crime, or what did the tax increase go to. Angry? See you at 6:30. 10:47, Good point, really good point! Could someone tell me what Proposition A money is? I think tonight will see a lot of pissed off people going on about the water bill fraud going on right now. Water bill fraud? What fraud? I was told by an insider that people complain at the City Hall front desk about the cost of their water bill. It does no good as they are complaining to those who are defending City Hall. 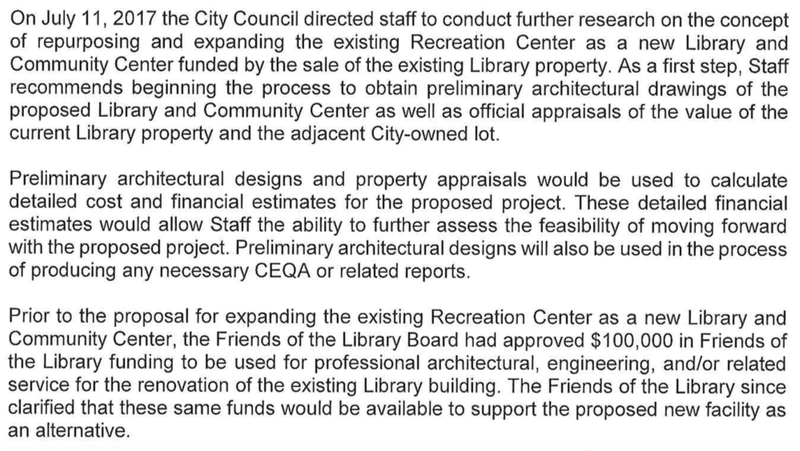 The sale of the library lots will not generate the money needed for this project. They will have to get a bridge loan while they build the "library" and make the move all before the new developer gets to tear the old place down. All the construction will even disrupt the outdoor spaces for a considerable time. Oh the headaches. Oh the cost overruns. All while stop gap patching the city water mains goes on and on and on. Proposition A was a county-wide measure for open space acquisition. Open space or parking up at the Utilities house, next to float barn. The Hastings Branch has been a community room for years. Various groups also pay a fee to hold classes and lectures in the classroom next to the bathroom. Remember that all of this is being handled by politicians. And what is a politician? Someone who tries to solve a problem that doesn't exist, in a way that can not be explained. I heard there's a fire above the upper canyon? Mt. Wilson Trail - behind One Carter. Some idiot up there smoking? He was checking on his 6 plants. Any information about the fire? Looks like it was at the early part of the Mt. Wilson Trail. Spectacular work by the helicopter pilots. Fast air defense. Effective water drops, thank God. Hey folks, moving the library's location does not require a vote of the residents. It only requires 3 votes. Your yapping doesn't mean a thing. 4:26 - How much do they cost? And do you have to buy them one at a time, or is there a group discount. 4:16 I think so. But now the earth moving equipment is arriving, and it will be a long night of making sure. Try to stay up on city business, and you have to wade through Gene Goss having a baseball poem as "invocation." We were hit with those absurd penalties 3 billing cycles ago. Glad to hear others are fighting mad - all we got was the standard blame. Wonder what the city will do....and how far back they'll have to refund? Bet they won't refund a darn dime. I remember when Vern Hensel was charged the incorrect rate for years, when discovered, he got zero dollars back. I remember that, too 8:08. Was there a statute of limitations or something that the city used against him? Let's hope the complaint numbers are sufficient this time to force the city to make some refunds on those outrageous penalties. The City will never refund money as there is a shortage of it at City Hall. They will only give it back if legally forced to do so. I hope somebody else is up to watching this....and will post any decisions that will eventually be made. A couple was just at the podium...mad as hell and not going to take it any more! They had an outrageous fine as they are East of Baldwin and on winter allotment rates. Being so hot, they used more water and bill was extravagant. I know the frustration. I live west of Baldwin. My meter was read in May, then again in July. The new rate starts on July first. So all the water I used from Mays reading to Julys reading is charged at the new rate that goes into effect on July first. Seems illegal to me. At best there should be two rates, the amount incurred from Mid May to June 30th. The second charge should be the cost incurred from July first to the mid July meter reading. I'm frustrated too, my water is still brown and smells of chemicals! Sell the water company and use the money to fix the library. 7:54, Didn't Ron Coleman complain about the very same thing a couple of years ago? The Council just approved spending the Friends $100,000. Of course they did. Then they'll use that information to sell the city on demo'ing the Library. Such an obvious ploy. Did anyone hear the individual vote? I think Delmar voted yea. Was the vote all yea? How Many Pasadena Cops Were Selling Guns Online? The Tattler Wishes You A Happy 4th of July!